"We believe that merely handling an exceptionally made product and smelling the ample beeswax in its polish can satisfy the soul." The world is moving faster every day and our lives rush past us at the speed of light; at Els & Co. we turn back time to an era when craftsmen could live out their passion. A time when pride in what you made was more important than how many you could make. Our vision is to revive the lost art of leather craftsmanship and to produce beautiful, well designed yet practical and functional products that you’ll only have to purchase once in your lifetime. Throughout the centuries leather has always been synonymous with quality and durability, with hand stitched products often outliving their first owners. Els & Co.’s roots lie in this essence of leather; its texture against your skin, the smell of it when you walk into our workshop, the way it gets better and better with every passing year. When cared for it ages like a good bottle of red wine. It softens to the touch, gains battle scars and develops character, charming its current owner into wanting to use it. Like a good red wine, to craft an exceptional leather product you have to start with the best components. And so our products are crafted from the best quality top grain vegetable tanned leather we can find. We source solid brass buckles and clips from small artisanal foundries, and the canvas and felt we purchase from family owned weavers that have been in business for over 200 years. To further achieve that genuine old school finish we sponge dye the leather, then oil it with our own mixture of beeswax and animal fat. Once moulded we painstakingly hand stitched every single stitch, an art in itself that takes several years to master. But the result is a product that looks and feels like it was made 100 years ago, abundant in charm, and if cared fore it will last lifetime. Our biggest challenge was finding craftswomen in a mass-producing world, no small feat. So, although we’re a for profit company, we believe that a strong social conscience will breed a corporate culture that will ensure the sustainability of Els & Co. into the distant future. And thus it’s become our mission to build a business that will assist women to uplift themselves; women who were not fortunate enough to be afforded the opportunities that most of us so easily take for granted. And women because many of them have the latent skill required for the fine detailed work of our craft but more so because women are socially more responsible than men, especially within the low income sector. If we thus give a woman an opportunity to uplift herself we know it’s an entire family that will benefit from it and so slowly, one woman at a time, an entire community is uplifted making a truly notable difference. We employ Xhosa women because the Xhosa tribe, like so many of the African tribes, has an underlying sense of pride; and pride in what you do is the first step to becoming an exceptional craftswomen. Training is all done hands on during production and it takes around 24 months for a craftswomen to acquire the skill to make some of the more technically challenging products and up to 5 years to become a skilled craftswomen who can tackle any project coming through our door. 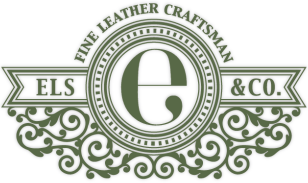 Our entire team had no prior knowledge of leather craftsmanship before joining Els & Company and hand in hand we struggled through a very long hit-and-mis period to eventually get to the very high standard we pride ourselves by today. Keeping the focus on our craftswomen and believing that “genuinely hand made” is a vital part of our company DNA; every product is made from start to finish by a single craftswoman and is proudly embossed with her initials. Under “Our Team” on our website you’ll find a bio on each of them with a sample of their signature stamp to easily identify who made your valued leather article. The backbone of Els & Co. is our incredible team of craftswomen who manage and run the entire production process from start to finish. This ensures their skill set is transferred from one person to the next, growing their knowledge base with every passing year. Our next dream is to create a craftswomen’s trust that will own a substantial portion of the company. The trust will serve as a vehicle to assist our craftswomen in schooling their children, affording proper medical care, finding sustainable ways to feed their families a healthy diet, upgrading their living conditions, etc. But significant profits are still some distance away so in the meantime we work hard and practice patience. Lots of patience. And so we believe that our business model is sustainable and that Els & Co. will still be here 100 years from now, uplifting women. When investing in an Els & Co. product you are thus not only buying a top end leather item, you’re also buying into a belief that we can all make a difference, one small bit at a time.